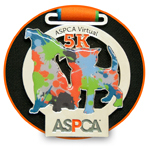 This June, Polly would like to ask for your help supporting her human as she participates in the inaugural ASPCA Virtual 5K. 16-yr-old cats are simply too old and too tired to run and, really, they are cats and wouldn't dream of running as a team, anyway. Your donation will help the ASPCA provide life-saving programs and services to millions of cats--and dogs, too--nationwide. The ASPCA is very important to me and I appreciate your help as we fight to give abused and homeless animals a second chance at a good life.